Barron’s “Are you a special snowflake? I’ve had my sights set on purchasing this series FOREVER now! Okay, slight exaggeration – but ever since I discovered this book a year or so ago, I’ve been in dire need of this. This book’s BASICALLY an introductory pamphlet on what it is to be me…no word of a lie. I resonated with this novel on SO many levels that I couldn’t help but laugh until my imaginary abs couldn’t handle it any longer…then I continued to laugh some more. CAUTION: When reading this book, be prepared for the following: constant giggle fits, snort laughs, extreme stomach pain due to laughter, spitting food or beverages out if reading while eating, weird glares if you read in public (for you will laugh out loud whether in a public or private setting), uncontrollable desires to read more Sarah Scribbles Comics, etc. 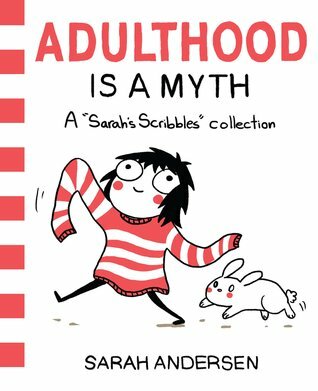 Since the comics in the Sarah Scribble’s series are similar in format and design, I will only be writing a review for Adulthood Is a Myth. Adulthood Is a Myth is a book that literally illustrates what it’s like entering adulthood when you’re a socially awkward introvert who’d rather hide in the comfort of one’s home than enter the realm of ‘adult social interactions’. Extremely funny and witty, it will tears of joy to all who read this (yes…biased…but I don’t care). What I adore about this book is how relatable it is. Even my friends who are rather extroverted relate to at least ONE thing is this comic, though they tend to relate to a number of the comics. It’s not a typical novel that flows from one point to the next, but rather a number of little snippet comics that discuss different themes and topics. From the joys of smelling a book to the love of having a SMALL number of close friends, this book covers a wide array of subject matter that those entering adulthood can’t help but laugh at. The only issue I had with this book…is that it ended! It’s a novel that I not only felt connected to, but use to show people how I feel and what I mean when I say I’m a rather awkward individual. It’s a comedy yet it can help people truly understand what it’s like to be someone who’s awkward and introverted and just different from the norm…whatever that is. The only real consistent ‘character’ would be the girl who appears on most of the pages; it’s assumed that her name is Sarah, after the author, since the book is based off of Sarah Andersen herself. She doesn’t really use her name, but that’s deliberate according to an interview. Obviously, there’s really no development; the comic is simply as a means to show the number of funny situations us awkward individuals get into and to get a SMALL glimpse into our mental states and thought processes. All the characters (especially Sarah) are funny and witty and adorable, but Sarah obviously steals the show. Seeing her reactions and choices for interactions just makes you go into a giggle fit. Sarah Andersen illustrated the comics herself, stating she went through many trials and errors before coming up with the final product. Lack of colour and rather simplistic, I actually found the drawings extremely adorable and appealing. The simple and elegant style actually worked rather well for the content; the utterly hysterical ways in which the drawings depict the theme of the comic is wonderful. Furthermore, the illustrations reflect the main character well, with the big eyes and grand gestures to the hilarious situations she catches herself in. Other than discussing the hilarity behind the word choice and the script itself, there ins’t too much to discuss regarding the language. Andersen uses language used in everyday use, common enough that a LARGE part of the population will read this with little to no trouble. ; nothing overly extravagant or complex, which is great when you want to just relax and read a ‘day-read’ novel. However, be prepared to laugh at some of the things said in this novel. An absolutely tremendous read, Andersen’s comic is a great choice when you simply want a book that’s a light and funny read. Though this is purely for comedy, Andersen’s graphic novel helps demonstrate the ways in which we awkward individuals think and act, showing the reasons for our odd thoughts and tendencies. If you’re looking for something relaxing and hilarious at the same time, go pick up Andersen’s novel – I doubt you’ll be disappointed. 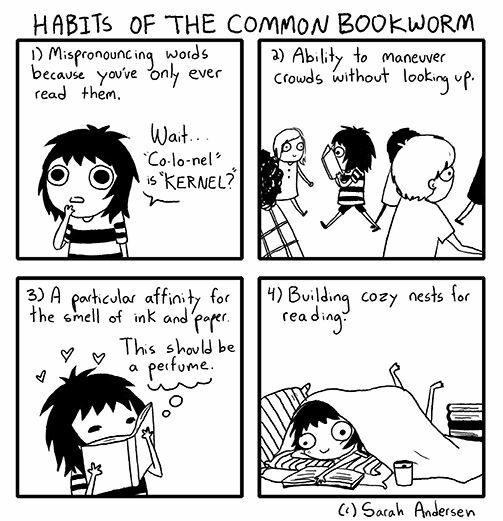 I adore Sarah Andersen’s comics. They truly are the most relatable thing ever. I read every single collection of hers and I just think she is so brilliant. Plus I think her illustrations are super cute! Great review. Herding Cats is just as good as her previous ones, hope you love it! I need this book in my life!! I’ve seen this going around but never really paid much attention to it. Now you made me wanna read it… Thanks for the review! Thank you for the compliment! I highly recommend it!! Please let me know what you think! I have a feeling you’ll love it! It’s such a hilarious read! !